Have only a short stay in London? See more of the city’s landmarks in less time—and enjoy a memorable way to travel—on a Thames river cruise. 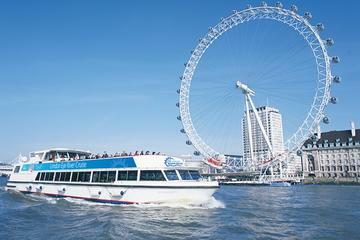 Pick from numerous daily departure times, and head to the London Eye Pier, where you’ll hop aboard your vessel. As you cruise along the river, glimpse monuments ranging from St. Paul’s Cathedral and the Tate Modern to Big Ben and the Tower of London. Live commentary is included (as are audio guides in eight additional languages). Please go to the London Eye Pier 15 minutes before the time shown on your e-ticket. Strollers or heavy luggage are not allowed on The London Eye.